I’m new to the forum and relatively new to Lego collection but over the last year I have acquired quite a bit of new and old sets. 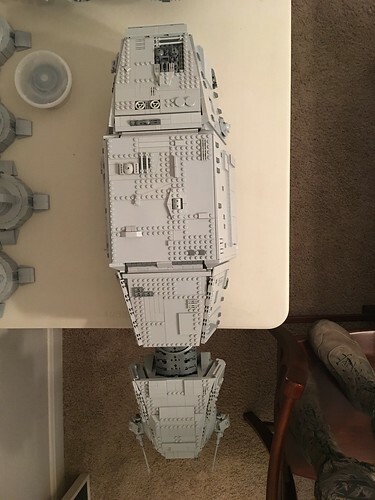 I got started bricklinking the UCS Millennium Falcon, Cavegods AT-AT, and finally the Imperial Shuttle. Now I have modded each of these sets and thought I might share a few pics from my Imperial shuttle. The other pics just show that the top is able to slide in and out to open up the interior, when the top is in place it retains the stock look of the model. If you have a Flickr account embed the images, if not create an account and do as I instructed, there are tutorials online. The mod looks great though, looking forward to seeing the others! 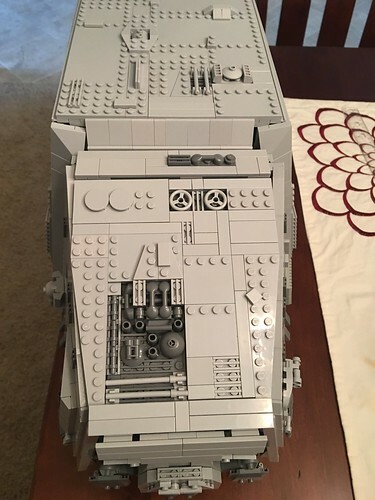 So I did a fair amount of modification to Cavegod’s AT-AT but unfortunately I don’t have pics of them all, the ones I do show in the pics are the back of the head and the top plates. I made the front and back plates fit better while also locking them into place when you place the final top plate on, i will try and find the pics if anyone is interested. The Mods i made to the Millennium Faclon helpful the gaps in specific places around the lower central gunner area, again I have other small mods just couldn’t find the pics for them. damn....bricklinking 3 amazing UCS-models...i'm bricklinking the shuttle at this moment and i find this one already hard to get it together. If your referring to the imperial shuttle it was relatively easy compared to the other 2, the key is to try and limit the amount of stores to go through. I think the most expensive part was the cockpit window other than that pretty straight forward. Truthfully I don't remember the actual cost I do know it was around $500. when it is ready i want to start a topic about my journey of brickling the shuttle, but I think, like Redbird said, it will be around €500. I know i started this for the imperial Shuttle but i couldn’t help adding some more pics from the AT-AT. So this morning I decided to tackle adding a ramp onto the Imperial shuttle. I ended up first designing on LDD then i went to work addressing the model itself, attached are the finished pics. 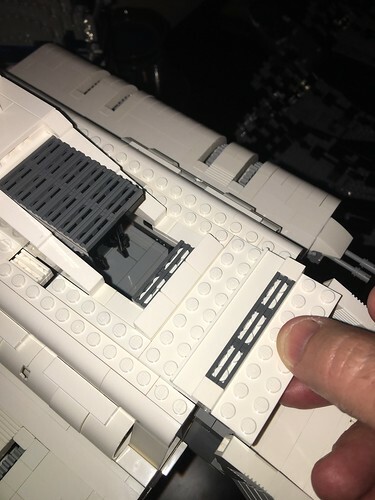 I also mode the landing by adding slightly more height allowing for the minifigs to stand underneath the cabin. I think it finally gives the model a better representation when the wings are folded up and the landing gear are on. Tell me what you all think. Great work by the way, they all look brilliant! I have struggled with posting pics which is why I’m using Flickr. Ok so I decided to re-enigneer the landing gear for the Shuttle, I like the way it came out because it gives me another way to display it without the clunky set that was originally designed for it. if anyone one is interested in the parts/design I can post it here later. I have the LDD instructions for this mod in a PDF is anyone is interested. I'd be very interested in information about the mod to the landing gear and boarding ramp. I have enjoyed reading your topic and I am really impressed with the improvements you've made. Your shuttle looks fantastic, well done. PM me and I’ll send you the LDD PDF for the landing gear it uses many components from the set so if you have sufficient bulk it should be relatively easy. one thing that I haven’t detailed is that you have to remove the (4) Dark Grey 1x2x4 pieces to allow for fitment of the 1x4x6 on the landing gear. I don’t have the LDD finished for the ramp yet but as soon as I do i’ll let you know. 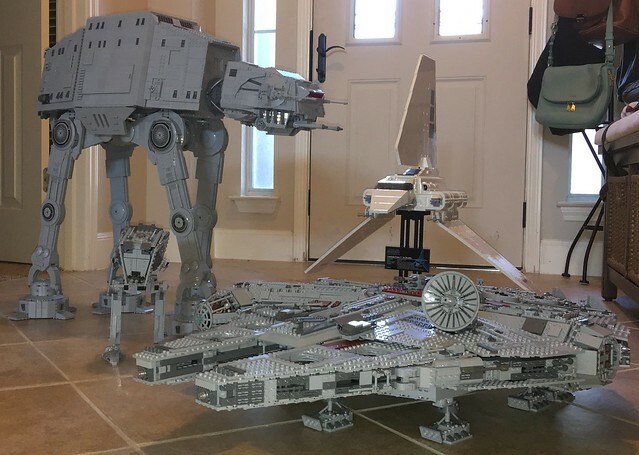 Your AT-AT looks beautiful, is it minifig scale ? Do you work as well with LDD for it ? The AT-AT is at about 1 1/2 mining scale it is Cavegods model, if you are wanting the instructions to it look through the forum there are specific threads on this topic which identifies the individual you can purchase the instructions from. As for my mods to the Imperial shuttle just PM me with your email address and I’ll send you the PDF file, as stated earlier I’m still working on the ramp LDD and will send out when finished. Thanks for the interest in my mods this is the first time I have sent these out so seeing interest makes me feel like appropriately updating already fantastic models. Well it has been awhile since i posted anything and now my weird obsession with the UCS Shuttle has brought me back again. So I have never been happy with the landing gear and decided to tear into this project again. i always felt that the landing gear needed to be attached to the structure of the model and not just an add on, also I wanted it to be able to be displayed on the stand in the landing position. So after tearing the ship apart one last time I think I'm satisfied with the outcome. I also went with some SNOT techniques around the ship as well as updating the engines, ramp, and rear gun. AWESOME job!! Would I be able to get the plans for the landing gear and the ramp please?